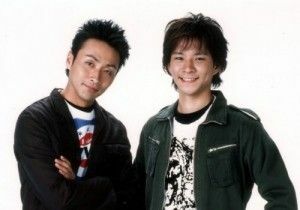 This is the comedy duo of Date Mikio (you can’t forget him with his bright bleached blonde hair) and Tomizawa Takeshi, winners of the M1 grand prix (comedy competition), and masters of both Manzai and Konto. 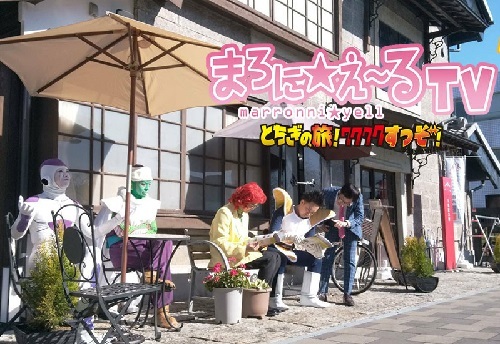 They often mix these two different styles of comedy, using props and backgrounds, but then switching into direct Manzai. They have and continue to appear on a numerous amount of variety shows, with a wide range of comedy style in their acts. Tomizawa is often the funny guy, who says weird things, often nonsensical with Date reacting. These guys are at the top, and they know it, but they never stop striving to be even funnier. 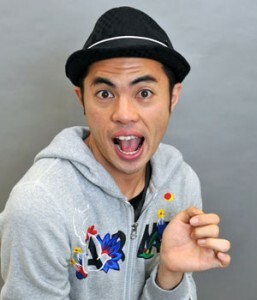 Kojima Yoshio is a one-hit wonder (well, he’s still trying hard and has obtained some additional success) Japanese comedian famous for appearing in a very tight bathing suit and doing a ridiculous song and dance in 2007. He popularized the phrase Sonna no kankei nai (that has nothing to do with it), Ueeeee (a funny sound he makes) and Oppapi (which is apparently an abbreviation of Ocean Pacific Peace). All of these catchphrases are used during his signature dance, which has him hunched over doing a punching motion towards the ground while his hind leg is kneed upward simultaneously. While he took Japan by storm with his dance and had people of all ages mimicking him, his popularity has slowly faded. 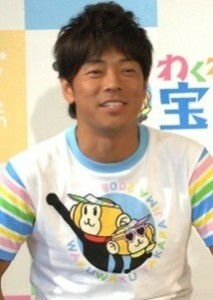 He still appears on variety shows and is funny, but it is hard to overcome the perception of him and his one major hit. He is also really smart, attended an excellent university and his humor (besides his silly dance) is quite excellent.He is a part of Japanese modern culture that can’t be missed. 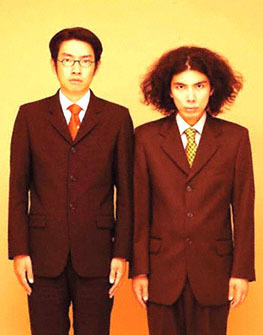 Rahmens (ラーメンズ) is a Japanese comedy duo with Jin Katagiri (片桐仁) and Kentaro Kobayashi (小林賢太郎). They have a wide range of comedy, but what really made them famous was their series of Japanese lessons. They take on the role of a teacher and student in various countries, and imagine how terrible and strange Japanese lessons are given throughout the world. The way they play with Japanese, puns, and just pronunciation in general gives a hilarious look at the language as a whole. What’s so great about these videos is regardless of how much Japanese you know, you will find yourself laughing at their ridiculous takes on Japanese classrooms. This is highly recommended for anyone who studies Japanese and has been in a Japanese classroom before, and just as recommended for anyone who always wanted to see how ridiculous Japanese can actually be. Unjash is a popular comedy duo composed of Kojima Kazuya and Watabe Ken. Their humor focuses mainly on big conversation misunderstandings. One of them is talking about something, and the other one misunderstands the subject that he is talking about and continues the conversation as though the subject is what he thinks it is. These two different conversations somehow coincidentally match to create a proper conversation that could match either subject except with very hilarious results. Because of this constant back and forth action they often both play the boke (funny man) and tsukkomi (straight guy) roles.Many of their acts are easy to understand because at the beginning, it clearly sets up what each side is thinking. For example, there will be a subtitle on either side that will say “is talking about his girlfriend” and “is talking about his car.”While this is their main style, they also have other various acts which are just as good. You can find a lot of their sketches on YouTube. In 2012, Kojima had a bit of a mini break with his own super funny man reaction style on variety shows. Both of them have individually appeared in the occasional J-dramas as well. Jinnai Tomonori is a popular prop comedian from the Kansai area in Japan. He usually sets up elaborate and unique stages and engages in some crazy and original ideas that are not comparable with any other comedian out there. He makes heavy use of CG images and videos, as well as pre-recorded voices (sometimes his own, sometimes others) that he converses and reacts with.His style is also to build up a lot of small jokes into one final ending laughter explosion. Thank you. I’m going to watch them all before they get deleted. I love 陣内さん and アンジャッシュ, all three are really clever, easy to understand comedians, but I like アンジャッシュ a lot more. I don’t really laugh much (occasionally I blow air through my nose) at English comedy, but for some reason アンジャッシュ makes me laugh every time, by keeping most of their material fresh. I think I have never laughed this much in my life…the ending to ぶつかった二人 had me in tears. 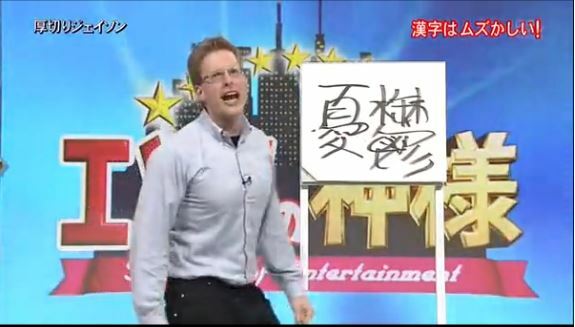 Japanese comedy expressions, the confused look, the over the top anger, west could NEVER copy. I’ll check out Sandwich Man after 1500 cards or so :P.